Safely and securely mount your smartphone with the Kenu Airframe+ Universal Car Mount in black. 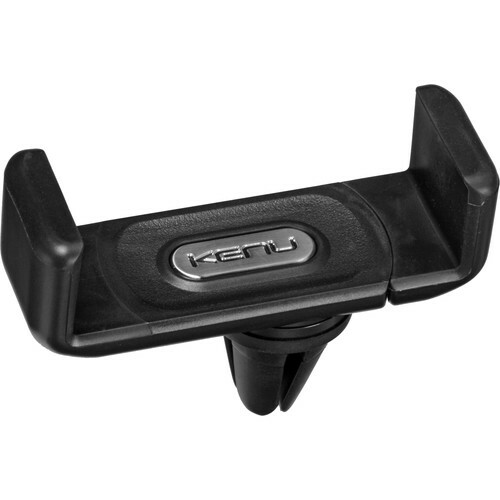 This mount attaches to your vehicle's air vent, letting you easily position your device and move the mount between vehicles. Grippy material keeps it in place without damaging your air vent and it can be used in portrait or landscape mode. When not mounted in a car, insert a credit or ID card into the clip and use the Airframe+ as a tabletop stand. The mount accommodates devices up to 3.4" wide and 0.7" deep. It allows full access to cables and buttons and fastens to horizontal, vertical, angled, and round vents. Box Dimensions (LxWxH) 7.05 x 4.2 x 1.0"
Airframe+ Universal Smartphone Car Mount (Black) is rated 5.0 out of 5 by 4. Rated 5 out of 5 by Ron from Works great- spend a little more an get an excellent product I bought this mount and the WizGear Universal air vent mount. ?This one is far superior. ?Easier to attach on the air vent and easier to attach the phone to the mount. ?A better product. Rated 5 out of 5 by Felipe from Keeps the iPhone 7 Plus on the air vent perfectly! Amazingly simple keeps my iPhone 7 Plus in place on the vent of my Honda HRV like it's glued!!! Perfect build, solid plastic, feels solid! Why don't you have one, get yours!!! Rated 5 out of 5 by Terence A. from Perfect This is amazingly perfect for me galaxy note 5!